Like so many others, Dungeons & Dragons was how I broke into the hobby. I cut my teeth on the old “Red Box” set back in the ’80s and progressed to AD&D and then 2nd Edition in my teens and early 20s. Recently, I’ve been playing a 3.5e campaign with my friends and have been enjoying it very much. I never played 4e, but didn’t hear a lot of good things about it. Still, I find myself more than a little excited about the notion of a new version of the game I love coming out for their 40 anniversary. It looks like the game will just be marketed as “Dungeons & Dragons”, not “5e” or “Next”, as had been the play-test version. It also looks like the core rulebooks are going to be released not only separately, but months apart. This is supposedly to avoid production problems that apparently plagued the release of 4e, resulting in a lot of post-publication errata being released. I’m not sure how that’s going to enable people to start digging in and playing, but the D&D R&D guy, Mike Mearls, has indicated that “You will not need the MM or DMG to run a campaign. 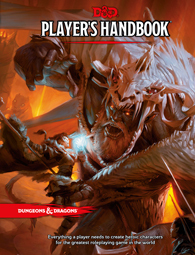 Or the PH or Starter Set to make a character.” It’s not clear at this time how that will work–will there be online tools to use (like Pathfinder’s “Pathfinder Roleplaying Game Reference Document“)? Another point of controversy is the price point of the core rulebooks: $50.00 apiece. Will this price it out of the range of teens…or even dollar-conscious adults? Many games now release with a single core rulebook at $50.00. Supplemental materials are always available (of course), but you can generally hit the ground running with just the $50.00 investment. The books are gorgeous and, no doubt, chock-full of useful information. It will be interesting to see if the price ends up being more of a turn-off for fans. At any rate, I hope Wizards does well with the release. They have a venerable and much-loved property in their care and I hope they prove to be up to the task.